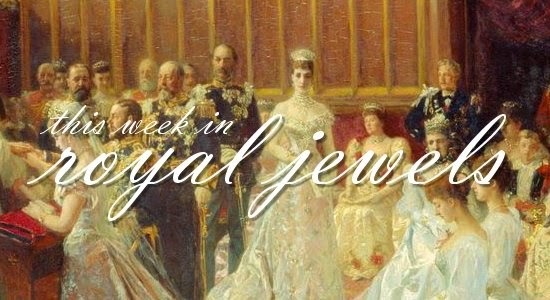 From a Grimaldi jubilee to a pair of British brooches, here are my top jewel picks of the week! Be sure to vote for your favorite in the poll below. 10. Camille Gottlieb, daughter of Princess Stephanie of Monaco (and therefore also a granddaughter of Princess Grace), wore a pair of trendy pearl earrings with a double stud at the Fight AIDS charity gala on Friday. For more jewels from this event, as well as the weekend celebrations of Prince Albert's jubilee, head over here! 9. The Duchess of Cornwall wore one of her trademark pearl chokers, this time with the round diamond clasp, at a primary school in London on Wednesday. 8. In Wales last Thursday, Camilla wore the Faberge brooch given to the Queen Mum by Nikita Khrushchev while tasting wine. I feel like the Queen Mum would approve. 7. Crown Princess Victoria wore a slender pair of hoop earrings during her birthday celebrations on Tuesday. You can see more about the jewels worn by the other members of the family -- and see lots of pictures of adorable Estelle! -- in our post over here. 6. In Spain on Thursday, Queen Letizia wore her black earrings with silver star detail during a visit to music classes associated with the Princess of Asturias Foundation. 5. On Tuesday, Letizia wore her rose gold Folli Follie earrings for an event at Spain's Air Force Academy. 4. During the royal family's annual summer photo call, Queen Maxima of the Netherlands wore dangling earrings with a bracelet she wears often. It's engraved with the names of her husband and children. 3. Princess Charlene didn't just wow the Monegasque people by making her first speech in French on Saturday -- she also dazzled them by wearing her enormous Repossi engagement ring. More of Charlene's weekend jewels can be found in our post here! 2. During the commemorations of the anniversary of the Battle of Britain, Queen Elizabeth II wore a favorite brooch, the Jardine Star Brooch. More jewels from the commemorations can be seen in our post here! 1. On Thursday, the Queen wore a gorgeous brooch set with opals for a visit to Barking and Dagenham. The brooch was a wedding gift from a retired military league from Australia, and it definitely gets my top spot of the week!